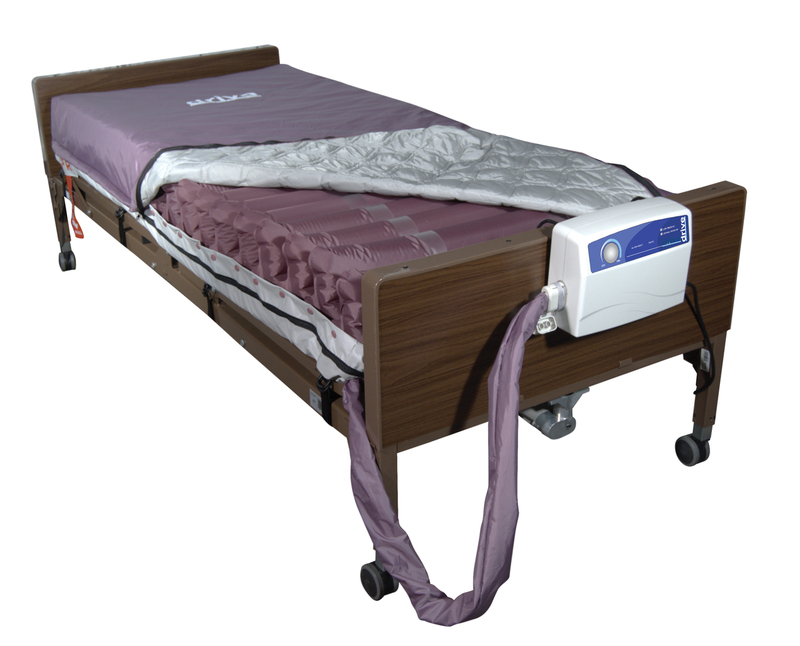 The Med Aire Alternating Pressure Mattress Replacement System with Low Air Loss by Drive Medical provides alternating pressure and is designed to be used in the prevention treatment and management of Pressure Ulcers. The mattress has 20 air bladders nine with laser holes to achieve the low air loss function and to increase patients comfort by keeping the affected area cool and dry ensuring a speedy recovery. The Aire cells are 8" high and are constructed with 40% nylon/60% PVC for longevity and durability. The zippered mattress cover is constructed with a quilted urethane coated nylon fabric which is water resistant vapor permeable machine washable and low sheer safeguarding the patients skin and comfort. The "Whisper Quiet" pump produces a consistent air flow and the special vibration isolating features insure that the patient rests easily. The LED and audible alarms provide critical performance date and alert a caregiver when the pressure falls below 10mmHG guaranteeing the patient is always comfortable.